Today promised to be one of the best days of the whole trip but the dreadful weather turned it into more of an endurance test. We left Durrensteinhutte at about 8 and it was already raining hard. The landlady told me that the weather was going to stay bad and that it was impossible to walk to Sexton in a day. Still, it hadn't snowed and last night she told us the path would be impassible if it did. The first 2 hours were spent following the E 34, a fine path, and the work that had gone into its construction suggested the hand of the first world war military. We were just to the north of the old front line and there were military installations all along the route. 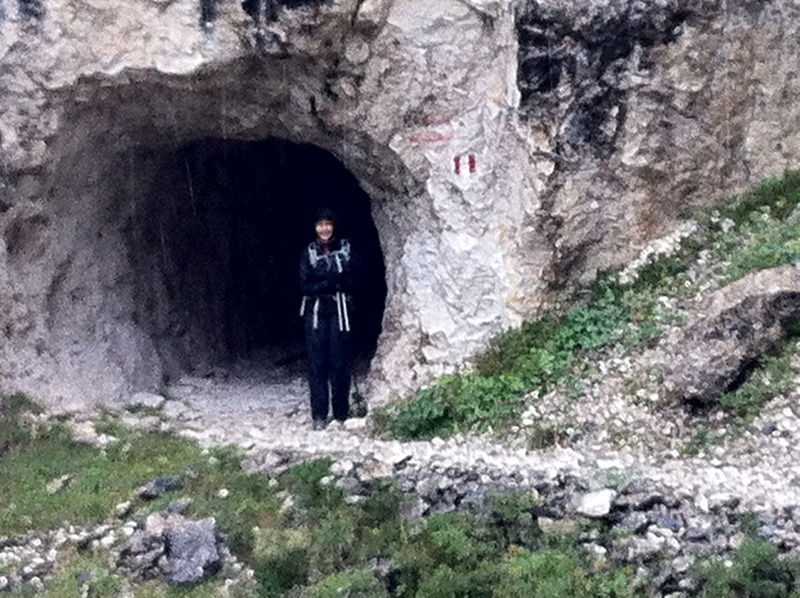 At one point the path was carved out of the face of the cliff and at another it tunnelled through it. Dropping down five hundred metres or so the density of military ruins - concrete rifle trenches and tiny forts - increased, presumably to stop the Italians coming up the pass. On the other side of the road we took a trail up along the Val Rinbon, following the river and gradually climbing. It was miserable. We knew there was lots to see but clouds covered everything and we were getting wetter and wetter despite being encased in Gortex. After a couple of hours we reached the end of valley and started the steep climb up over the pass. Christine and I refuelled on chocolate (Paul, very cold, had shot on ahead) but it didn't help much. It was hard work and despite our expensive waterproofs we were wet through. At last, after about 45 minutes and a series of false summits we crossed the final ridge and saw the huge and very welcoming Drei-Zinnen-Hutte. The "Drei-Zinnen" - the three peaks - are one of the most iconic sights in the whole of Dolomites. Three giant jagged teeth, the subject of millions of postcards, but today completely covered by cloud. 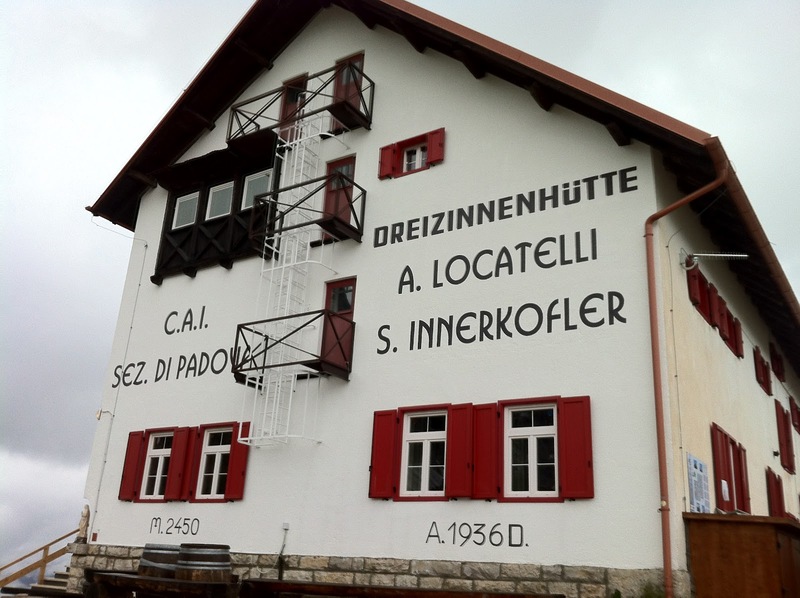 Still the Drei- Zinnen-Hutte provided a chance to escape the rain, get some warm food and thaw out. 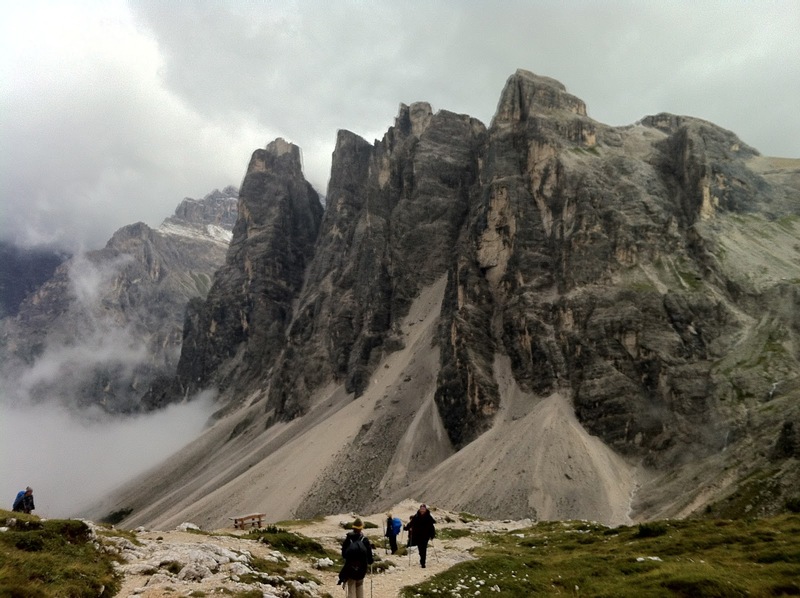 It then stopped raining, not exactly sunny but the clouds did lift enough to remind us what a magical place the Dolomites are for walking. Huge cliffs everywhere and paths heading off in all directions. Just a glimpse had us saying that we had to come and walk this stretch again on a better day. Although it had stopped raining we were still cold and wet and Christine in particular was taking no prisoners. She was almost running down the mountain and Paul claimed he could see sparks coming from her shoes. 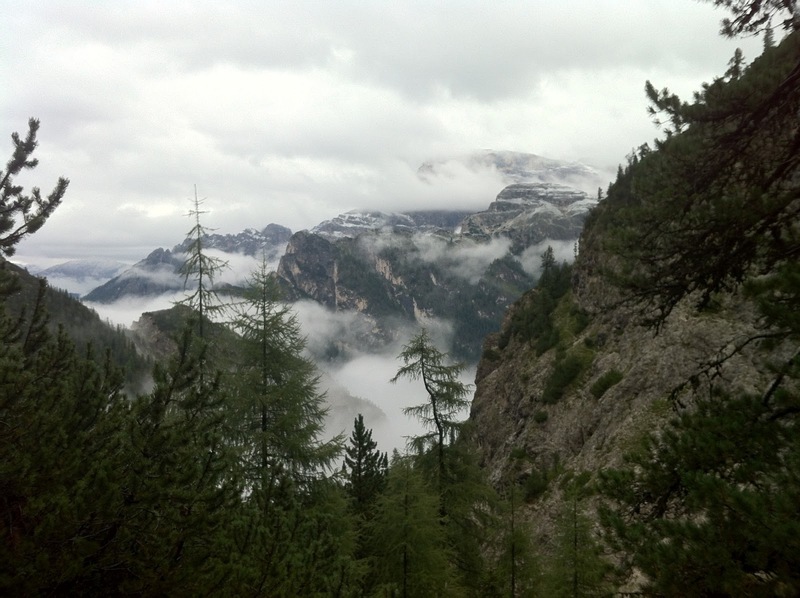 Down past huge towering Dolomiti we had soon lost the 1000 metres we had gained so painfully in the morning. Into Sexton and after a bit of aimless wandering we chose a hotel at random and very soon, a beer in hand, the misery of a wet day was behind us. 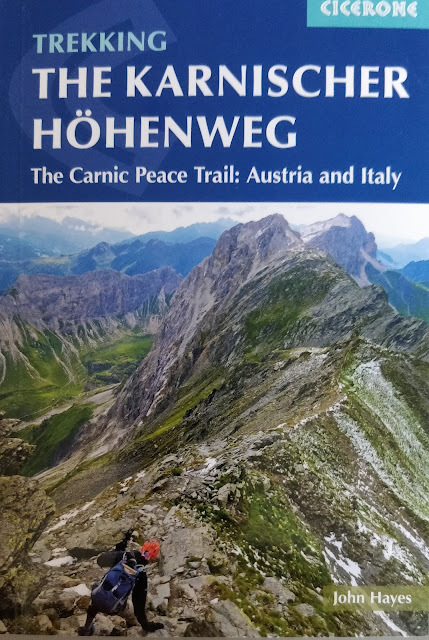 Tomorrow we start the Carnic Way proper, the last week-long leg of the trip. The weather forecast is not good.